Getting my gaming commentary game back on, with an appearance as a talking head-and-torso for a special Global Gaming Expo episode of APCW Perspectives, featuring venerable online gambling gadfly J. Todd at the mic. The TL;DR — Kahnawake Gaming Commission is pulling its casinos out of US markets to do business with New Jersey, further putting the squeeze on gray-market online gambling operators … and it’s probably not good that the Senate introduced SB 3376, a placeholder bill for a revised version of Sheldon Adelson’s Restoration of America’s Wire Act, um, Act, aka RAWA. Even if the new bill is going nowhere, simply having it in the legislative mix poses a threat. Oh, and happy soon-to-be 10th birthday UIGEA! On February 11th, David George-Cosh broke the story of the release of an undated internal document produced by FinTRAC addressing the challenges of cryptocurrencies, primarily bitcoin. FinTRAC is Canada’s anti-money laundering and counter-terrorist financing watchdog. The document is a slide deck that was produced further to an Access to Information Act request. The WSJ blog post on the release is here. A copy of the deck that was released to the public under Access to Information is here. It’s important to remember that most of what is in this deck does not represent a normative policy position being taken by FinTRAC on cryptocurrencies. (Though note that pages 24-25 of the .pdf document fairly characterizes how FinTRAC views bitcoin vis-a-vis money services businesses under the current Proceeds of Crime (Money Laundering) and Terrorist Financing Act and Regulations.) I think the bulk of it represents an earnest and honest attempt to canvass available resources and learn about bitcoin. Many bitcoin aficionados might take issue with how some points are set out and the substance of others. However, I think it’s a decent overview and a good start at fairly covering a lot of ground. Over the coming months, we may see how FinTRAC uses this knowledge as they work with the Department of Finance to introduce anti-money laundering and anti-terrorist financing regulations for cryptocurrencies, as promised in the recent federal budget. Meanwhile, to catch up those of us who may have checked out for a semester, gaming law expert I. Nelson Rose explains rather succinctly the other day, in an appearance on Fox Business, where things currently stand with Obamapoker the slow rollout of American online gambling. And, he explains, why California online poker doesn’t really stand a chance this year (even though politicians are still happy to take your donations for giving it the good-ole college try) — go 2014! If you had cash on Full Tilt shortly before Black Friday, you’ve got until this weekend to inform government contractors that you’d like your money back, please. Check out what I got in the mail recently from the poker world’s new-good friends at Garden City Group, who are handling Full Tilt remissions on behalf of the DOJ, whom you may or may not recall earmarked nearly $200 million of PokerStars money for paying back Full Tilt player/ponzi victims. Presuming I didn’t unknowingly luckbox into some sorta secret errant money transfer, I think this postcard campaign reveals a GCG serious about covering various asses should someone and their lawyer(s) can come back later and claim ignorance when trying to get a piece of any FTP payout pie. Otherwise you gotta wonder … they didn’t have my email address — the one that just about everybody remotely connected to poker has? (You know, the one that has been the same ever since signing up with Full Tilt in ’04?) And yet they were able to track me down through a postal address that didn’t even exist for me or Pokerati until after Black Friday? 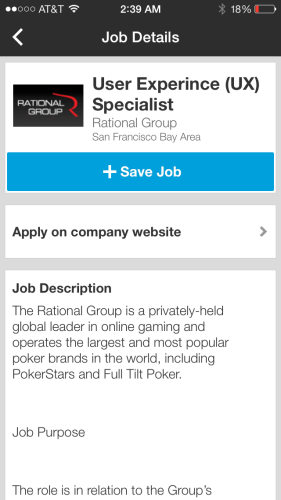 It wasn’t anything I ever provided to Full Tilt Poker, PokerStars, Garden City Group, nor the DOJ, as far as I know. In fact, I could be wrong here, but I think the only federal agency that would have this address for me is the IRS. Hmm … makes you wonder what kinda sit-n-gos the NSA really might be playing! If you haven’t yet submitted your online poker DNA to Uncle Sam and you still want a chance at seeing your Full Tilt bankroll ever again, visit http://fulltiltpokerclaims.com/. Last week, I shared with you a plan to get individual lawmakers involved in helping to expedite remission processing for those of us with accounts on Full Tilt Poker. I have very good news on that front. 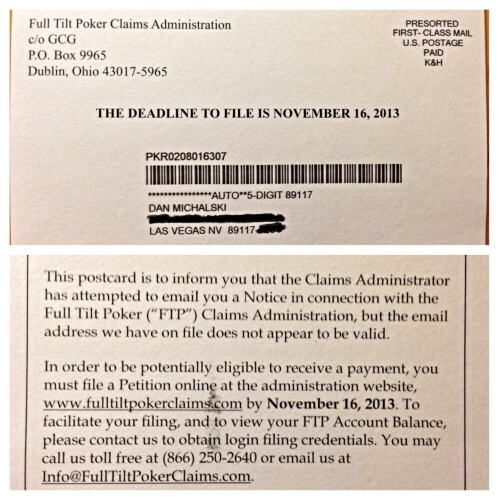 On August 1st, Full Tilt Poker Claims Administrator Garden City Group posted a status update on their website promising that the claims process will begin “shortly” and clarifying that remission will be based on final balances and not on deposits. I encourage you to read the entire statement on their website, atwww.fulltiltpokerclaims.com. This announcement shows that progress is being made. Over the past several weeks, PPA and the poker community intensified its pressure on the DOJ and Garden City Group to expedite full remission of player funds. Even members of Congress began weighing in on behalf of their constituents. While many factors contributed to the timing of the announcement, there is little doubt player activism played an important role. While this announcement is much-needed good news, we cannot rest now. We are seeking specifics, including dates for application, expected dates for processing, etc. We are also seeking as streamlined a process as possible. Op-Ed: Punishment should fit the crime of trying to kill me! On June 26th, 2010 I was cowardly attacked from the rear with a tire iron by Edmond Price. I was initially hit at least twice on the head with full force with this lethal item. Have you ever been hit by a tire iron with full force? It could easily crack your skull open and spill your brains out. As dazed as I was I still had the presence of mind to grapple with Price to keep him from hitting me with this tire iron again. While defending myself against Price’s attack Victoria Edelman, his fellow conspirator, starts bludgeoning my cracked skull with anything she can get her hands on. She breaks a lamp over my head into thousands of chards of glass. She breaks a toilet tank lid over my head. She impales the crown of my head with an iron. She takes my two wheel dolly and converts it into a hoe that she rakes across my bleeding skull. These are only the items I recall being pummeled with. There were probably many more. During this assault I sustain a severe concussion, fractured cheek bones, ruptured ear drums, several severe lacerations on my head and hands and multiple broken bones in my hands and fingers. My right thumb is almost detached, my left middle finger is almost severed. My ring finger nail is almost ripped off. My ribs are all damaged, perhaps fractured, making it excruciating to breath. Somewhere in this fray I am even scalped! In this century I’m probably one of the only people in the entire World who has had the misfortune of being scalped let alone surviving this brutal torture! 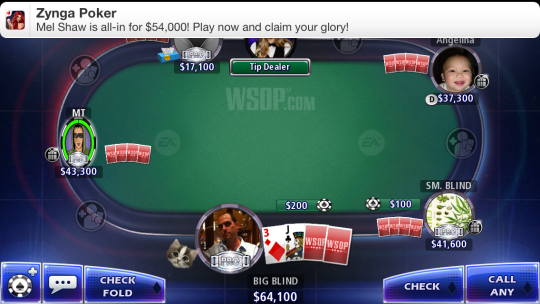 With WSOP.com in play and in more poker players’ pockets, Zynga finds it tougher to bring players to their tables. The Empire put a hit on the Mafia and buried the farm. Two years after Caesars Entertainment Corp. perplexed Wall Street by acquiring social gaming operation Playtika, the casino giant has moved past rival Zynga Inc. to the top of the business model. Social casino games are free to play on the Internet, through Facebook and other platforms. Customers have the option of paying a nominal fee — often less than $1 — to acquire thousands of gaming tokens to increase their virtual bankroll. Apparently, those pennies add up. One Wall Street analyst estimated social gaming is now worth $1.2 billion worldwide in annual revenues. Caesars Interactive Entertainment, a subsidiary of the casino company that controls Playtika and the World Series of Poker, now owns a large chunk of that market. Playtika’s Slotomania brand — slot machine and bingo-like games — is fueling the effort, which sent Zynga, owners of Farmville, Mafia Wars, Words with Friends, and a platform of casino games, including Zynga Poker, into second place. “Social casino gaming has essentially gone from being a nonexistent sector a few years ago to one of the most popular gaming genres on desktop and mobile (devices),” Adam Krejcik, managing director of Eilers Research, recently wrote. You’ll be able to watch a livestream of the hearing, which hopefully will finally remove “click a mouse, lose your house” from the conversation and instead address real issues of money laundering, privacy concerns, redress of grievances, bot use, and identity protection — not to mention what kinda data you can keep about other players, and what kinda hand histories the government can keep on you! Gambling regulation may historically be a matter left to the states, but regulation of the internet is kinda new, and something Uncle Sam has wanted a role in for establishing minimum standards at least since the White House unveiled its strategy for consumer protection on the internet … [Bump-bump-buhhh] … on April 15, 2011. Meanwhile, we also have a new Barton Bill — HR 2666, which has a surprisingly ungodly bill number and stated goals of protecting poker players from consumer fraud by establishing a federal program for the licensing of Onternet poker by States and federally recognized Indian tribes. This bill may or may not also have the benefit of helping “poker only” ride along with other online gambling bills yet separate itself if necessary to distinguish its unique sector of the online “gambling” landscape. WHAT: On Tuesday, July 16, John Pappas, PPA’s executive director will be joined by Representative Joe Barton (R-TX) on a media teleconference to discuss Mr. Barton’s newly introduced bill, The Poker Freedom Act, to license and regulate Internet poker. The bill mandates technologies to protect consumers from fraud and limits underage access, preserves state’s rights, and ensures Indian Tribes have the same rights to apply for a license as other entities. The poker community may or may not have lost its verve for writing checks to politicians only to sweat subcommittee hearings that in the end prove about as significant as WSOP Day 1s. But this combo of activity is indeed the start of something — a new baseline at least, as poker interests presumably have until the end of the year to make something happen before all special interests get told the same thing about what’s impossible during an election year. WASHINGTON — The wall of framed photos with political heavyweights from Ronald Reagan and Margaret Thatcher to Barack Obama — reputedly one of the more impressive collections in town accumulated over 30 years — has been taken down. Two dozen boxes of papers and memorabilia are stacked on tables, on the floor, and atop filing cabinets, awaiting delivery to a warehouse in McLean, Va., where they will join another 35 boxes being transferred from storage in Maryland. Among the few items not wrapped and packed in Frank Fahrenkopf’s corner office, which is located a block off Pennsylvania Avenue, are the custom desk from London he had crafted 24 years ago, an American flag standing in the corner and a knickknack of herding elephants signifying the job he once held as chairman of the Republican National Committee. 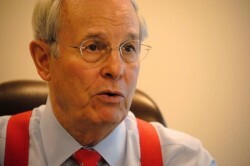 Fahrenkopf, who turns 74 next month, is downshifting after nearly two decades as the face of casino gambling in Washington and one of the most prominent Nevadans in the nation’s capital. The president and CEO of the American Gaming Association until he stepped aside on July 1 is plotting what comes next. Over the years, he has alternately put out fires and served as a missionary for the commercial casino industry that once was concentrated in Nevada but now is an economic driver in almost half the states. “It was a perfect storm in a way that when the industry needed to have someone, I happened to be here,” Fahrenkopf said in a recent interview. But after staying on the job for an extra year in the for-now-dashed hope of helping to guide the industry into federally recognized online poker, he was completing his tenure. “It just reached a point where 18 years is a long time. It’s always good to have fresh people come in,” Fahrenkopf said of the job he took when it was created in 1995 with the intention of staying just a year. Cleaning up or Cleaning out? #1. Bet Raise Fold – Sunday was the worldwide release of the much-anticipated online poker documentary that has – so far – garnered an overwhelmingly positive response from advance viewers. Buy your copy here. If you supported the KickStarter campaign, you should have already received your link to view the movie via email. #2. Kentucky – After successfully extracting a cool $15mm from bwin.party, Kentucky looks set to continue their litigious ways against other operators that took online bets from the state (and have some resources to target). I’ve been told to expect a significant legal filing related to Kentucky’s actions this week. #3. PokerStars vs ACC – The ACC filed their response last week to Stars’ application for interlocutory appeal. While we don’t have a firm deadline for a ruling, I can’t imagine the courts are interested in letting this battle drag on much longer, especially given that it clouds the ability of the ACC to pursue an alternative sale. The holiday may result in a delay, but a decision could still be forthcoming in the next few days. PokerStars clarified their policy for cheating and reimbursements. Griffin Finan explained why the DiCristina case is so important to poker players. The SLT revealed that Zions Bank took part in – and may be facing investigation for – online poker processing. CalvinAyre.com asked if Playtech has given up on the U.S. regulated market. The UK Gambling Commission released overview stats for 2009-2012. 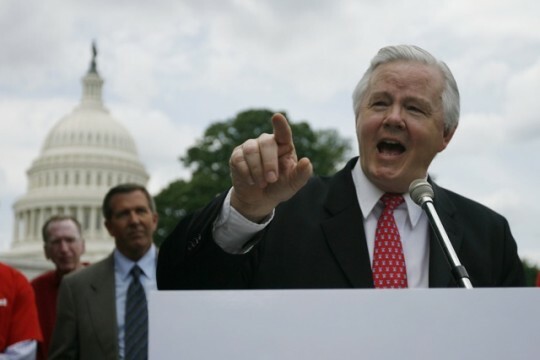 Joe Barton sounded an optimistic note regarding his yet-to-be-introduced online poker bill. Lock pros tried to sell Lock funds – cheap. CardPlayer stopped promoting unregulated sites to Nevada visitors. On this week’s Rabbit Hunt, Mark and I cover the One Drop action at the WSOP, debate the best way of responding to Adelson and try our best to read the tea leaves of PokerStars’s battle with the ACC. QuadJacks ran an article of mine imploring people to Stop Writing Responses to Sheldon Adelson. Finally, I offered up some thoughts on the Online Poker Compact Conundrum in the regulated U.S. market. #GoodRead – Brad Polizzano penned an informative and concise rundown of the 2013 NCLGS at QuadJacks. Gov. 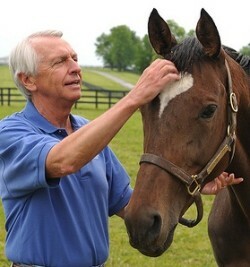 Steve Beshear (D-KY) is almost single-handedly making sure horse racing interests gets their cut of online poker spoils. I’m paraphrasing, of course, but I dunno man … it’s starting to seem inevitable that Antonin Scalia may eventually have to reveal his screen name and/or recuse himself to avoid violating any PokerStars T&C’s. But until then, the state of Kentucky is doing its part to make sure the Black Friday cases don’t go away. The governor’s office put out a kinda strange press release last week, just to let people know, hey, don’t be confused by recent reports of certain online gambling cases achieving final settlement. The great Commonwealth of KY, you may recall, made the bold assertion in ’08 that it had a right to take over foreign web domains that failed to block access by Kentuckians. And now they would like you to know with extra certainty that Kentucky only let go of their claims against Absolute and UB (after a $6 million score) but have not otherwise released claims against poker sites that still have any money left, which they plan go after in full force. Click here to read the whole press release. As New Jersey prepares for its next court hearing on Wednesday over its efforts to legalize sports betting, gaming officials in Canada are urging lawmakers to vote on a bill legalizing Las Vegas-style sports books. A bill introduced almost two years ago would allow Canadians to wager on a single sporting event at a time. It’s also seen as way to draw U.S. gamblers to casinos just across the border from cities such as Detroit or Niagara Falls, N.Y.
Canada offers a sports lottery in which bettors can parlay three or more games, but single-game betting is illegal under the Canadian criminal code. Burns said legalizing sports betting would discourage Canadian bettors from wagering on National Hockey League or National Football League games offshore or with illegal bookmakers. With Black Friday cases winding up, Mark Scheinberg could make out as the biggest winner in the poker universe. The chief executive of online gaming giant PokerStars agreed to forfeit $50 million to federal prosecutors to rid his himself of a two-year-old complaint filed by the U.S. government. 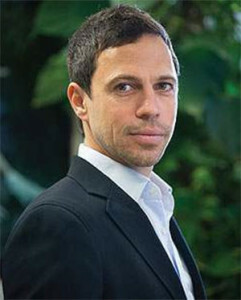 In a settlement agreement this week with the Department of Justice, the money being paid by PokerStars CEO Mark Scheinberg is based on allegations contained in the April 15, 2011, complaint filed by federal prosecutors against PokerStars as part of the government’s “Black Friday” crackdown on illegal Internet gaming operations. “The agreement is not in response to any action that had been brought against Mark and contains no admission of wrongdoing, culpability or guilt on his behalf,” PokerStars spokesman Eric Hollreiser said in an emailed statement. Last July, PokerStars accepted a $731 million forfeiture to the federal government to end the company’s legal battle with prosecutors. Three senior officers of PokerStars were charged in April 2011 with bank fraud, money laundering and running an illegal Internet gambling enterprise. The Justice Department absolved the company of any wrongdoing in accepting Internet wagers from American customers. PokerStars also wasn’t prohibited from entering legal U.S. gaming markets.